From expanding veterans' access to VA health care to assisting with their post-service career path - and even giving wounded veterans a chance to skydive - MOAA honorees at Tuesday night's ceremony on Capitol Hill were celebrated for their unique efforts to support military members past and present, and their families. MOAA President and CEO Lt. Gen. Dana T. Atkins, USAF (Ret), presented awards to six individuals and one organization during the event. More than 170 MOAA members representing all 50 states and Puerto Rico gathered to celebrate the recipients. Recipients were honored with the Colonel Arthur T. Marix Congressional Leadership Award, MOAA Distinguished Service Award, and Colonel Paul W. Arcari Meritorious Service Award. The ceremony came hours before MOAA members were to return to the Capitol as part of the annual Storming the Hill advocacy effort. The 2019 Colonel Arthur T. Marix Congressional Leadership Award - named for the retired Marine Corps colonel who founded MOAA in 1929 - was presented to Sen. Jon Tester (D-Mont.) and Rep. Phil Roe (R-Tenn.). The award is presented to members of Congress who distinguish themselves in protecting the rights and interests of uniformed servicemembers, their families, and their survivors. Past recipients include Sen. Lindsey Graham and the late Sen. John McCain. 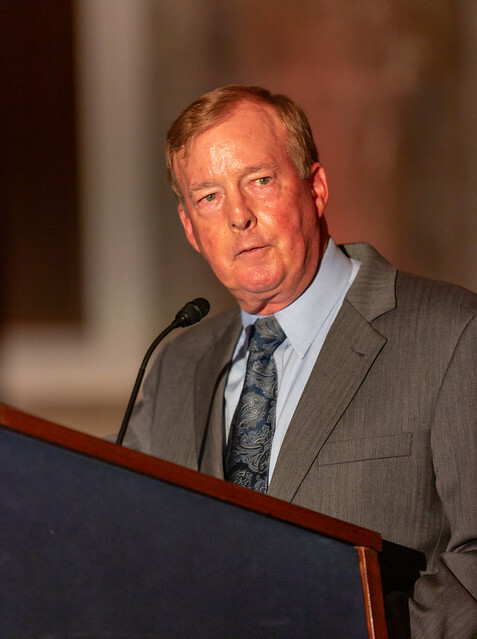 Dr. Roe, a Tennessee Republican and Army Medical Corps veteran, sponsored the VA MISSION Act, which President Donald Trump signed into law in June. The act includes a number of VA reforms designed to improve care and access to benefits. Tester, ranking Democrat on the Senate Veterans Affairs Committee, thanked MOAA for recognizing his efforts. He lauded the organization for its feedback that helps shape legislation that benefits veterans. Tester was a key player in the Senate passage of the VA MISSION Act as the only Democrat among the legislation's initial cosponsors. He was elected to his third Senate term in January. MOAA's Distinguished Service Award, which recognizes people or organizations that have helped people who serviced in the military, was presented to LinkedIn and to retired Army Sgt. 1st Class Dana Bowman. The award has been presented since 1997. During the past year, professional networking site LinkedIn began offering a free premium membership to military spouses who are making PCS moves or whose spouse is leaving service. LinkedIn continues to offer one-year premium memberships to servicemembers and veterans, along with military-specific career programs, webinars, and other tools. Bowman, a double amputee, was recognized for his effort to help wounded warriors through his nonprofit HALO for Freedom Warrior Foundation. Bowman, a former member of the Army's elite parachute team the Golden Knights, collided with his partner Sgt. Jose Aguillon during a skydiving maneuver in 1994. Aguillon died instantly; Bowman lost both of his legs. Bowman's foundation provides support for wounded warriors facing medical, social, financial and emotional challenges as they recover. The signature event - Weekend to Remember - provides outings ranging from helicopter target shooting to NASCAR driving experiences. Besides incredible experiences, Bowman said he hopes he can provide an environment that fosters strong friendships among people with similar experiences. Finally, MOAA recognized three congressional staffers with its Colonel Paul W. Arcari Meritorious Service Award for their advocacy and support of issues affecting servicemembers, veterans, and the military. The award is named for the retired Air Force officer who led MOAA's government relations department for more than a decade. Tony McClain, a staffer with the Senate Veterans' Affairs Committee; Ray Kelley, a veteran who now serves as a staffer with the House Veterans' Affairs Committee; and Lt. Col. Dan Sennott, USA (Ret), of the House Armed Services Committee, were honored.